THE Naval Forces Western Mindanao (NFWM) has donned ranks and awards to the Fleet-Marine Personnel for gallantry in action while in the performance of their mandated tasks. Rear Admiral Rene Medina, NFWM commander, led the donning of ranks to the newly promoted enlisted personnel and awarding ceremony to the gallant sailors and marines held on Monday, February 4, at the NFWM headquarters in Zamboanga City. 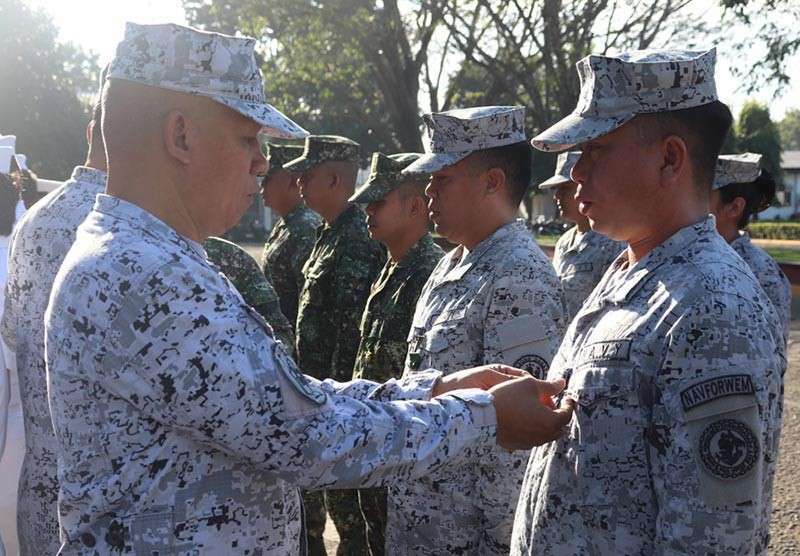 The award of Bronze Cross Medal was given to Marine Battalion Landing Team-11 (MBLT-11) and 83rd Inshore Boat Company of the Inshore Boat Battalion for the successful conduct of raid operations on November 23, 2018 which led to the neutralization of Alias Abu Nibras, a known Basilan-based Abu Sayyaf Bomb maker. Alias Abu Nibras was behind the July 2018 Lamitan City bombing incident that killed 10 people, including five militiamen. The members of the Seaborn Patrol Unit of Naval Station Romulo Espaldon also received the award of Bronze Cross Medal for the successful search and rescue operations of the victims of a distressed motor boat on October 20, 2018 near Maasin village, this city. Military Merit Medal is given to the officers and men of Philippine Marine Ready Force-Sulu (PMRF-S) for services rendered during the conduct of security operations assisting the Commission on Elections (Comelec) in the January 21 plebiscite on the Bangsamoro Organic Law (BOL). Military Merit Medal was also given to the officers, enlisted personnel and civilian employees of NFWM for attaining the highest rating among other Naval Operating Forces during the conduct of Annual General Inspection 2018. The members of basketball team and the men and women volleyball team of NFWW also received the award of Military Commendation Medal for participating and winning as 1st Runner up during the Inter-Government Agency Basketball and Volleyball tournament organized by the city government October 2018 to January 2019. Medina congratulated and commended the sailors and marines who were just promoted to the higher rank as well as the awardees for the exemplary performance of their duty. Meanwhile, Medina condemned the recent bombing of Our Lady of Mount Carmel Cathedral in Jolo, Sulu and grenade attack on a mosque in Zamboanga City.